From Sinatra to Lady Gaga, Abba to Beyonce! 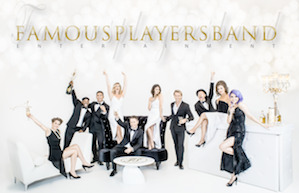 Famous Players Band is a group of insanely talented musicians who, collectively, change the way people experience live music. This is NOT your average wedding band. At every party they play, their off-the-charts energy becomes contagious, leaving the crowd begging for more. 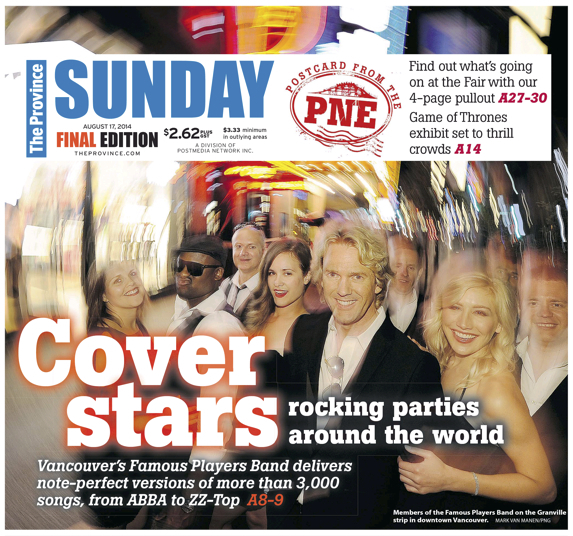 They have been widely recognized as Vancouver’s best live band for ages, and for good reason. Now more than ever, people want the music played at the event they’re holding to cater to the wide and diverse tastes of guests from all different backgrounds. Famous Players Band expertly achieves this by offering an enormous catalogue of song choices from their impressive repertoire which includes Abba to AC/DC, Adele to Michael Buble, Neil Diamond to LMFAO, Journey to Rihanna and everyone in between. 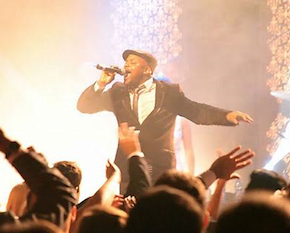 Clients can customize their event’s music to suit their preferences and those of their guests. Plus, they have mastered the art of ambiance whether it be a corporate event, cocktail party, or wedding reception, they have a knack for being spot on when it comes to gauging a crowd’s mood and using it to create a night that everyone wishes would go on forever. If you want your event to be remembered as something more than just a run-of-the-mill, DJ directed snooze-fest, Famous Players Band is the obvious choice. They have earned some truly stellar reviews and a Vancouver View article rightly proclaimed them "King of live entertainment". What’s more, most people who have seen them perform talk of experiencing a strange phenomenon that makes it nearly impossible for them to stay in their seats while Famous Players Band is on stage. The energy, range and depth they bring to their performances is astonishing and, watching them, it is obvious that they enjoy it just as much as the crowd does. They consistently keep an event’s momentum on a constant, thrilling upswing. When is the last time you heard someone say that about an event with a DJ? Not all party bands were created equal, so the saying goes…or something to that effect. No one else on the market can offer the show that comes along with Famous Players Band. They are the veterans at offering medleys of different genres, enabling audiences to get a taste of dozens of songs in a plethora of styles in one sitting, or more likely, in one long dance session. A wise man once said "do not do your cardio at the gym the day you’re attending a Famous Players Band party". Stretching is optional though, and recommended. We’ve all heard of ‘that special something’. No longer limited to overuse in 1980’s dating tapes, that ‘special something’ has come to be the truly determining factor for decision making in this age of choice. We may come away from an art gallery or museum exhibit, live theatre, a symphony, a rock concert, a coffee shop, anywhere really, and remark that we can’t put our finger on just WHAT it was that made our experience so unforgettable and unique, but it was something. Something that keeps us coming back for more. That ‘something’ with Famous Players is the less tangible, yet essential element that is brought to every gig with Famous Players: the incredible connection that the vocalists and musicians have with each other, and the chemistry that they build with the audience. FP is a collective of not only musicians, but of actors, dancers, business owners, students, graphic designers, writers, composers, and more, which allows skills and experience from across the board into a unique performance setting. They share an incomparable ability to come together as superb musicians, resulting in an unmatched experience brimming with that special something. "When I say you are rock stars I mean it both literally and figuratively! My client couldn’t have been happier and I have to say you are all so talented and professional that you are, as always, a pleasure to work with. Thank you very much for everything that you have done to make this event a complete success. I received so many great compliments and want you to know that I appreciate that you guys always go the extra mile. So thank you – thank you so very much." 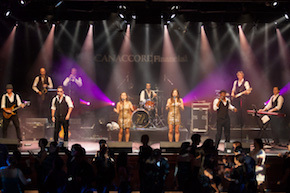 Kelly Clarke – Production Manager, Creative & Production Services Cantrav Services Inc.
"The band was out of this world!" "This band never fails to entertain an audience – the greatest party band I’ve ever seen!" "Famous Players Band was just fantastic! Everyone was dancing and didn’t want to leave at the end of the night. All our guests said it was the best band they’ve ever heard at a wedding!" "WOW!…you guys were fantastic – thank you so much for an amazing event, I couldn’t have done it without you!!! I have received so many compliments about last Saturday and everyone mentions what a great band we had!" "Thanks again to you and your awesome band for doing the job that thrilled the masses!I was getting comments all the next day as people were transferring to the airport. Your being as great as you were helps me to also look great to our client, and I thank you for that! I hope we can work together in the near future!" "All the employees said that this was the best Christmas party we have had here so far. Your band gave a great performance"
"I had only known Famous Players by reputation, having been turned on to them by a friend with the Safeway Foundation who brought them in for a gala benefit. Needless to say, I was blown away by their performance, as were my guests. In all my years of event planning I have never seen such an enthusiastic response to a group of performers as I did with FPB. Dealing with them was a delight, from contract phase right through post-performance, they were superstars but never prima donnas. I’d bring them back again in a heartbeat."